MixBin Electronics of Hamilton, N.J., is recalling about 275,000 iPhone cases sold in the U.S., Canada and Mexico. 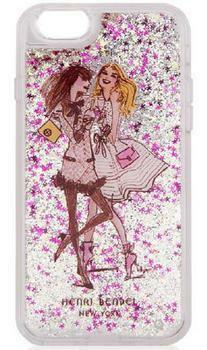 Liquid and glitter can leak out of the cases, causing skin irritation and burns to consumers. There have been 24 reports worldwide of skin irritation or chemical burns, including 19 in the U.S.
One consumer reported permanent scarring from a chemical burn and another consumer reported chemical burns and swelling to her leg, face, neck, chest, upper body and hands. This recall involves all liquid glitter mobile phone cases for iPhone 6, 6s and 7. The cases contain liquid and glitter that are floating in the plastic case. They were sold in various styles and colors and measure about 5.5 inches by 2.75 inches. The model number and UPC can be found on the product’s packaging. The cases, manufactured in China, were sold at Amazon, Henri Bendel, MixBin, Nordstrom Rack, Tory Burch and Victoria’s Secret stores nationwide and online from October 2015, through June 2017, for between $15 and $65. Consumers should immediately stop using the recalled cases and contact MixBin Electronics for a full refund. Consumers may contact MixBin Electronics toll-free at 855-215-4935 from 8 a.m. to 5 p.m. (ET) Monday through Friday, or online at https://phonecaserecall.expertinquiry.com/ or www.getmixbin.com for more information.